Hardware is hot — and poised to get hotter. Venture capital investment in connected device hardware startups reached approximately $1.48 billion in 2014, more than triple the amount of two years earlier. Meanwhile, the “fairy tale” acquisitions of Dropcam, Nest, Beats and Oculus — and the IPOs of Fitbit and GoPro — fuel public interest and momentum for new startups in hardware. The past decade made it increasingly easy for anyone with a bright idea to launch an app, thanks to the emergence of support factors as varied as crowdfunding, cloud infrastructure and open-source communities like GitHub . Today, an entrepreneur can just as easily bring a viable hardware product to market. Credit is due to many of the same factors — but also to a new breed of facilities that allow people to turn their bright ideas into physical products more quickly than ever before. 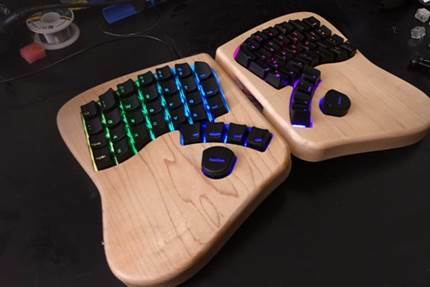 The Keyboardio ergonomic keyboard, which was incubated at Highway1 and is currently running a Kickstarter campaign. These facilities range from hackerspaces and makerspaces — where a user can tinker away and build an initial prototype — to more sophisticated hardware incubators that can help individuals turn a prototype into a working, production-ready product within a matter of months. While there are differences in how these spaces operate, their net effect is the same: They are subverting the traditional manufacturing model, spawning a new generation of innovative hardware startups in the process. Products like the Pebble smartwatch and the Nest thermostat — as well as other hardware innovations like SmartThings or littleBits — are proof positive that the next great hardware products won’t be born within the walls of large, traditional corporations, but in garages, makerspaces and hardware incubators. More importantly, they’re also showing the inherent connectedness of hardware and software — something that any great entrepreneur will recognize. The success of an ecosystem depends as much on people as technology. The number of incubators and accelerators is growing quickly. While there are well over a hundred incubators for early-stage software companies, the number focused on hardware has lagged significantly. In the last year, however, the number has grown from single digits to upwards of two dozen in the U.S. alone. Europe and Asia are joining the fray, as well, with stand-out shops like Unternemertum and Hardware.co in Germany, and DMM in Japan. Even well-known brands like Jaguar, Land Rover and Intel have taken note of this development and sought to emulate their nimble competitors by taking steps toward creating their own incubators. In doing so, these companies aim to support creative new entrepreneurs while rapidly pushing new ideas into reality. A similar mindset can be found at the Los Angeles Cleantech Incubator (LACI), where accelerating innovation and reviving manufacturing is at the core of their mission. There have been enormous developments taking place within hardware incubators as part of a larger transformation in the making of all things. New tools for prototyping and fabrication have become more accessible to everyone. At the same time, products are becoming aware and more interconnected — all as consumers expect a significantly more customized experience. The nexus of these trends has spawned a new wave of entrepreneurs guided by a fresh philosophy of design thinking. It’s vital for larger companies to acknowledge the innovation taking place at this scale, and they would do well to build relationships throughout the hardware scene, focusing on incubators and accelerators in particular, as they are the greatest opportunity to help move the conversation forward. There are exemplary innovation hubs in North America — like Highway1 in San Francisco, Bolt in Boston and AlphaLab in Pittsburgh, as pictured below — but this innovation extends to Europe and Asia as the movement grows globally. Partner with hardware incubators and provide software grants that give the incubated companies free access to powerful tools for design, engineering and manufacturing. Offer training and assistance on the software — free of charge — to ensure users can get the most benefit out of the tools available to them. Provide design assistance and counsel to startups. For example, Autodesk helped startup keyboard.io, an alumnus of the PCH Highway1 incubator program, tackle a design challenge with their customizable ergonomic keyboard. Focus on “the human element” by maintaining office hours, hosting events and finding ways to make useful connections and introductions. After all, the success of an ecosystem depends as much on people as technology. When building a new hardware product becomes as easy as making an iPhone app, we will have truly ushered in a golden era of innovation. Our dead, dumb devices of today will give way to products that can add unimagined value to our lives. Hardware incubators are playing a crucial role in making this new industrial revolution a reality, and it is incumbent upon all of us to continue to forge meaningful relationships that provide concerted support within the space. I’m excited to see how it unfolds.